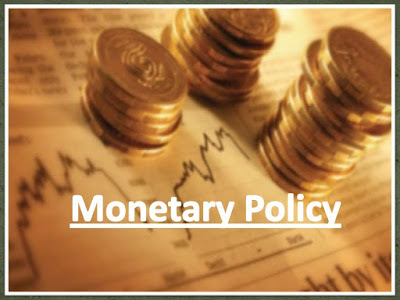 Monetary policy also known as the credit policy, is the policy which is purely managed by our Central bank of India (Reserve Bank of India) to control the money supply in the economy &amp; amount of credit in the economy. Monetary policy is governed by RBI . Monetary policy through both monetary and non-monetary measures influence savings , investment , output , income & price level in the economy. To control the money supply RBI uses various instruments. Basically RBI control these rates like Bank Rates, MSF, Repo Rate, Reverse Repo rate, Cash Reserve ratio & Statutory liquidity ratio in order to manage price stability in the economy & to achieve high economic growth. The main aim of the monetary policy is Macro-Economic stability by maintaining price stability and adequate flow of credit to the productive sectors of the economy. The Main important objectives of monetary policy are Price stability, Exchange Stability, Neutrality of Money, Economic Development, etc. It is one of the most important objectives of the monetary policy. RBI makes efforts to control price stability through various monetary measures. Under price stability the fluctuations in prices are to controlled to have positive impact on production, income and employment generation in the economy. In absence of price stability, inflationary and deflationary conditions are generated in the economy, which affects the various sectors of the economy. It is one of the traditional objective of the monetary policy. Exchange rate stability means to minimise the rate of fluctuation in the value of a currency in respect to the value of another currency. Stability in exchange rate will lead to outflow of money and encourage development of international trade leading to favourable balance of payment situation. Neutrality of money means to keep the impact of charge in the quantity of money on various elements like price, income, employment as constant. Neutrality of money does not mean that the supply of money is perfectly inelastic and fixed but it means to control the effectiveness of money. In a developing economy monetary policy encourage economic development by attaining equilibrium between money supply and demand. Economic development and the capital formation are closely related and the monetary policy through its quantitative and qualitative measures accelerating saving , investment and capital formation for rapid economic growth. Monetary Policy cannot directly influence economic growth but it can prove a conductive environment that encourages growth through low and stable prices. When prices are stable people can effectively plan to invest, save and consume.When there are indications of excess supply of money and rising inflationary pressures the banks adopt the dear or restrictive monetary policy through the contraction of credit. On the other hand, when there is low money supply in the economy i.e. in the deflationary situation, bank through cheap or expansionary money policy increase the supply of money in order to stimulate domestic demand. Every bank Maintain a certain % of their total deposits with RBI in the form of Cash and Net demand & Time liabilities. Current CRR is 4%. Every Bank has to pay the amount to RBI on every 15 Days. Every bank has to maintain a certain % of their total deposits in the form of (Gold + Cash + bonds + Securities) with themselves at the end of every business days. Current SLR is 20.75%. Bank rate is also termed as “Discount Rate” The rate through which RBI charges certain % for providing money to other banks without any security for Long period of time for 90 Days & Current Bank Rate is 6.75%. MSF is the rate through which bank can borrow funds for Short time – Overnight basis. Current MSF is 6.75%.